John E. Napolitano attended St. John’s University in Queens, New York, moved to this area in 1981, and graduated from the University of South Florida with a Bachelor of Arts in Communication in 1985. He attended Nova Southeastern University, Shepard Broad Law Center in Davie, Florida, where he received his Juris Doctorate degree in 1988. Mr. Napolitano was admitted to the Florida Bar in 1988, and is also admitted to practice before the Supreme Court of the United States, the United States District Court for the Middle District of Florida, the United States Court of Appeals, 11th Circuit, and the United States Court of Appeals for Veterans Claims. 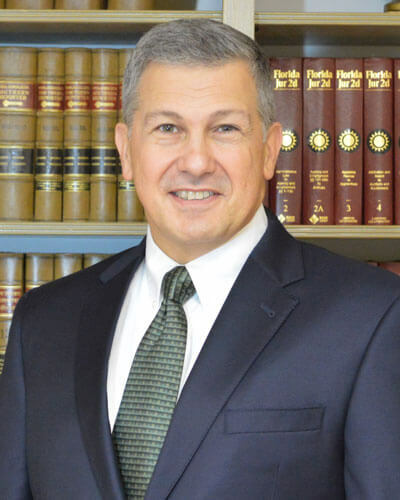 Mr. Napolitano has represented clients in courtrooms throughout the State of Florida for nearly 28 years in civil and criminal matters in both the public and private sectors. Currently, he serves as “of Counsel” to The Hogan Law Firm in the areas of Family Law, Personal Injury, and Corporate Law. He has been on staff, as an adjunct professor of law, at Nova Southeastern Law School where he has taught in the personal injury clinical program since 2000. Mr. Napolitano was honored to have be nominated by the Judicial Nominating Committee five times to serve as Judge in Hernando County and currently continues to serve as a judge and instructor with Hernando County Youth Court Program. He was selected as the recipient of the C-12 Servant Leader award from the C-12 Groups, a National Christian business association in 2009. Mr. Napolitano practices in the areas of family law and personal injury. He is located in the Hogan Law Firm’s Spring Hill location. Please contact Mr. Napolitano for an appointment to discuss your legal needs .